If you've dug through your camera's settings a few times, you've likely ran into the Color Space setting. You may have asked another photographer what it all means, and they've probably just told you to set it to one or the other, and forget about it. 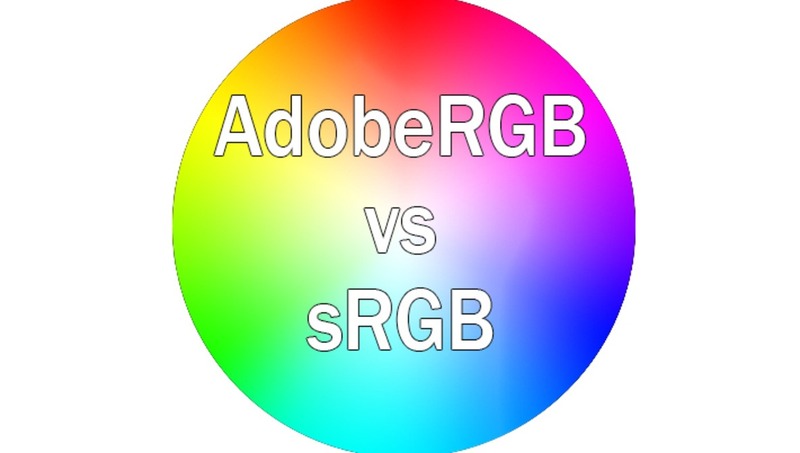 However, both sRGB and AdobeRGB have their advantages and disadvantages, so how do you distinguish one from the other? In layman's terms, color space is just a specific range of colors that can be represented in a given photo. JPEG images can contain up to 16.7 million colors, though neither color space actually uses all 16.7 million colors available. Different color spaces allows for you to use a broader or narrower range of those 16.7 million colors used in a JPEG image. The difference lies within what is considered wider and narrower color spaces. The image above explains it pretty well. Both images contain only three colors, however, the colors shown in the AdobeRGB scale have more differential between them. This means photos taken in the AdobeRGB color space will have more vibrancy in their colors, whereas sRGB will traditionally have more subtle tones. In situations where you're photographing strong color tones, sRGB may need to dull them out to accommodate, whereas AdobeRGB is able to display those colors with more accuracy. 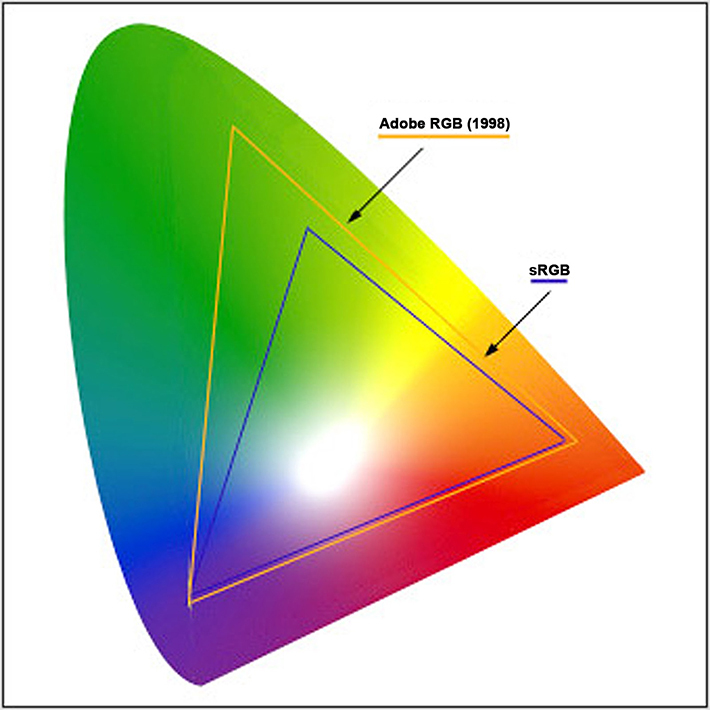 In digital photography, there are two main types of color spaces, AdobeRGB and sRGB. If you go into your camera’s settings, you’ll see that you’ll have the option of using either, straight out of the camera. You’ll also have the option of converting it to one or the other in post processing (with limitations), but which one should you use? To better understand which one to use, you must first understand the difference between the two. AdobeRGB, by all accounts is better, as it represents a wider range of colors. How much better? They say that AdobeRGB is able to represent about 35% more color ranges than sRGB is able to. But does that make it the best for photography? Not exactly, as the world works with sRGB far more than it does with AdobeRGB. sRGB came first, and almost everything on a computer is built around sRGB. 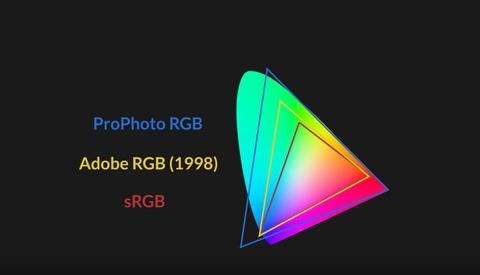 The internet, video games, applications, personal devices, and most everything else has adapted sRGB as their standard for color space. Even the monitor you’re using likely cannot display all the colors of AdobeRGB. 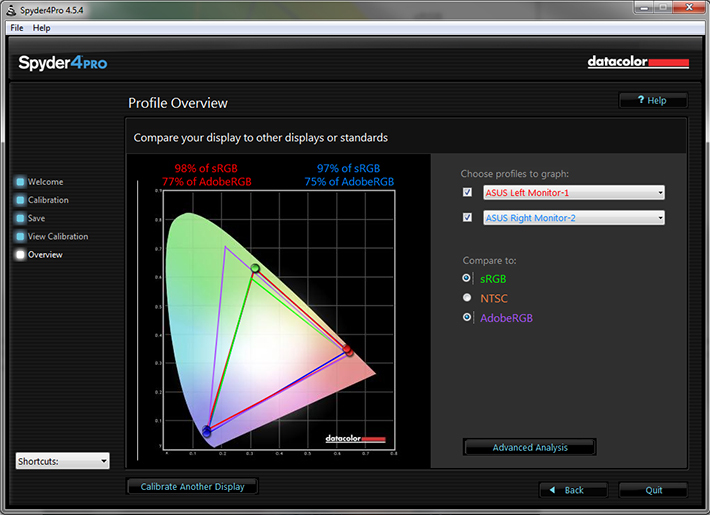 That's right, most traditional computer monitors can only display about 97% of the sRGB color space, and only about 76% of the AdobeRGB color space. Even screen calibrators will often tell you how much of the color gamut you're able to display. Since most web browsers have adapted sRGB as its color space, if you upload an image to the internet with the AdobeRGB gamut, the browser will convert it to sRGB, and it’ll do a terrible job at it, as shown below. The photo above is an unedited photo that I took this summer. If you shoot in AdobeRGB, and let web convert your photos, you’ll be left with dull, muted tones. So why not shoot in sRGB full time? You absolutely can. However, if you’re printing your work, you’re losing potential colors in your images by shooting sRGB. Printers, have began adapting the AdobeRGB color space. This allows for more vibrant colors in your prints, with better color consistency that your own monitor cannot even replicate. But do you want your prints to look differently than they do on your monitor? I say yes, as it provides richer colors that bring out details that would otherwise go unseen. 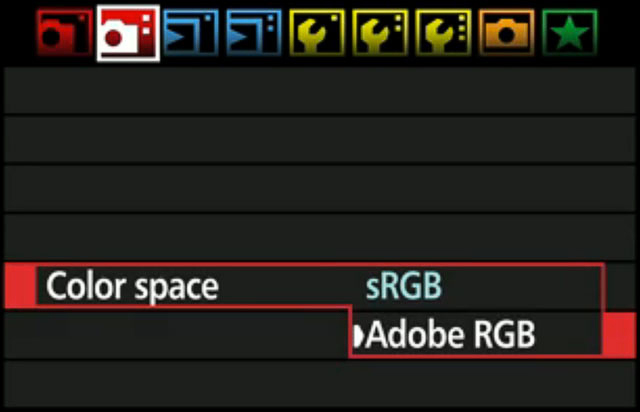 When shooting in AdobeRGB, you're able to convert it to sRGB at any time, without any loss of color in your images. However, this is a one way street, as sRGB is unable to accurately convert back to AdobeRGB. If you’re not printing your work often, sRGB is the choice of color space for you. 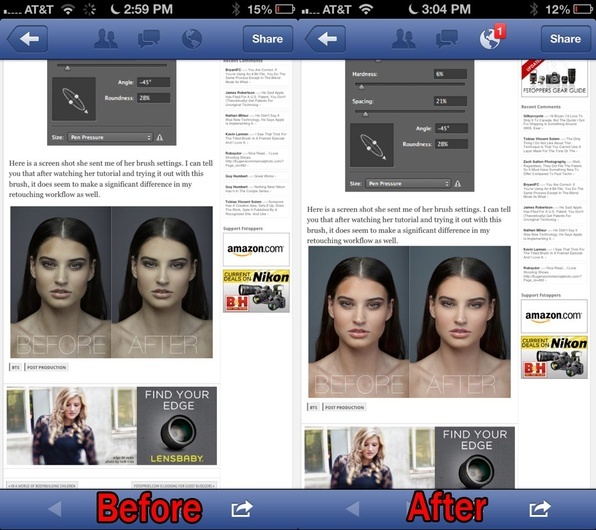 It’ll be the surefire way to guarantee that your photos look great on the web, and still look accurate in print. However, if you’re often printing your work, and looking for vibrant colors, AdobeRGB may be the choice for you, it just adds a few steps to your workflow process, as you'll need to save them as sRGB to correctly display them on the web. If you use a tandem of Lightroom and Photoshop, Adobe makes this conversion process painless for you. My workflow, and many others consists of loading images into Lightroom, making basic corrections, then importing the image directly into Photoshop. Upon importing to Photoshop, you can have your images converted for web with just a few simple setting adjustments. Simply go into Edit>>Preferences>>External Editing and adjust your color space to sRGB when being imported to Photoshop. 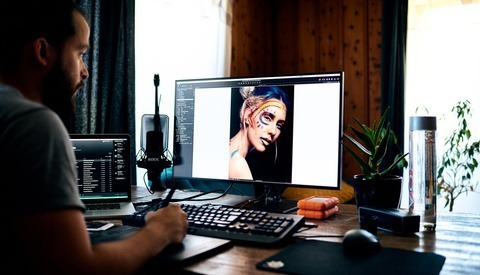 This technique is the most preferred, as it'll automatically convert all images you export to Photoshop to sRGB, without any color loss in the web format. This will also allow you to keep both an AdobeRGB copy of the image for print, and an sRGB version to use for web and everything else. If you work without Lightroom and still want the benefits of AdobeRGB color space, you can also convert your images for web in Photoshop. Simply navigate through your menus to Edit>>Convert To Profile and change your destination space to sRGB after editing your image. To insure that you do this everytime, I recommend you incorporate it an action used for saving your images. Remember, failure to convert your images prior to saving them for web will result in dull and unflattering color tones. If this at all confuses you and leaves you feeling overwhelmed, switch your camera to sRGB color space, and leave it like that. It'll still allow you to photograph and print beautiful images. However, if you're shooting specifically for print, AdobeRGB offers more range and versatility in the images taken. It all really comes down to personal preference, AdobeRGB does offer more colors, but at the cost of complicating things for a subtle difference in your photos. However, if you're a perfectionist, like myself, the extra steps taken to shoot in AdobeRGB may be worth the headache to achieve nicer prints, and get the best of both worlds. I'm not offended. I do have a pretty good understanding of color space, as I've worked with printing for many years now. I'm simply asking to take this post with a gain of salt. Its meant to provide a basic explanation of the two, and not to be as in depth and intense as some of the posts elsewhere might be. This is just an explanation for those who have no idea of the differences. I thought it was an excellent and practical article that would be of immense help to most people. I just did a YouTube video on this topic, and saw the same type of behavior. Whatever you say about RAW vs JPG or sRGB vs AdobeRGB will be hotly debated, with the most verbose of the writers offering the least knowledge or insight, but plenty of typing and opinion - - mostly all wrong. Current web browsers support colour management and will display colours accurately for AdobeRGB if the image is tagged with the colour profile. Otherwise you will get muted images as stated above. Lightroom automatically tags the images with the colour profile when they are exported. AdobeRGB is larger than the colour gamuts used in commercial print. There are some colours used in commercial print (ie some yellows) which are not contained within the sRGB colour gamut. If you are printing to an Epson or other photo printer you will be able to print colours that do not exist within the AdobeRGB colour gamut. ProPhotoRGB will preserve all the colours you can print on a good photo printer. You will need to work from RAW files if you plan to convert to ProPhotoRGB. I posted a video on Flickr this week that demonstrates this. While some browsers are adapting AdobeRGB color spaces, not all of them have yet. Most mobile browsers will not adapt to AdobeRGB yet. As for ProPhotoRGB, you're absolutely right. When shooting in RAW, you preserve all the colors used with in the image. However, if you outsource your printing, most print labs will not support .CR2 or .NEF files as its too much of a work load to convert correctly. So for printing, its recommend that you convert to AdobeRGB rather than sRGB, so you preserve more colors used for printing. 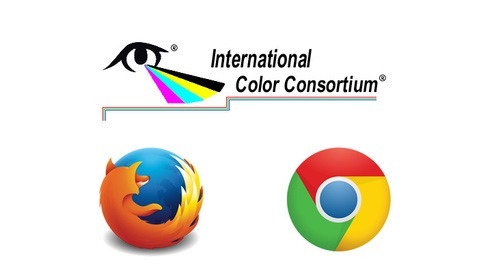 All current browsers support colour management and have done so for a few years. This includes Internet Explorer, Firefox and Chrome. They support not only AdobeRGB but will convert from any colour space as long as the image is tagged with the profile. Test it. I did....yesterday. And mobile browsers did not support AdobeRGB. But do you think we should consider about the mobile platform? What I mean is you can’t calibrate and profile phones. There are just two mobile platforms that support that right now. And these are Microsoft Surface Pro (and other tablets that use Windows 8) and Apple iPad. All the rest (like Android or Windows Phone or iPhone) can’t be calibrated/profiled. Take my Samsung Omnia 7 for example. It has a Super OLED display that has a bit oversaturated colors. You will have wrong colors no matter you have color managed software behind or not. But sure. I always convert my photos to sRGB for web use no matter of what I wrote above. never mind calibrating phones. 99% ( my guess ) of the world sees whatver you are trying to sell on an uncalibrated monitor, in unmanaged ambient light, at sub-optinmal viewing angles that it makes not a hill of beans worth of difference what yu export in.keep your raw files and re-output as required. SpyderGallery app is not color managed. YES. The web is going mobile faster than ever. If your website (where you display images) isn't mobile friendly good luck finding a job. 'do you think we should consider the mobile platform' lol, that was a bit rude. Also: I don't think that is the point. The reason for this post is: It is better to do this VS not do it. End of. So can you guys stop trying to find things to argue about? While Zach is correct that not all browsers, particularly mobile devices do not support sRGB. there is another issue to consider. CM unaware browsers do not convert to sRGB as the article states. They simply present the RGB values in their native space. Any non-grey build will appear more saturated in a larger colorspace. Hence when a large colorspace file is presented in the smaller color space of a non-CM browser, it appears less saturated. This is not conversion per-se, but merely presentation in the software's native space. Peter is spot on regarding the extended yellow gamut of the inkjets compared to Adobe 1998. The caveat to such a large space is that neighboring levels have a larger visual jump between colur HSV than in a smaller space. It's stated incorrectly in the article that Adobe 1998 offers more colors than sRGB. Numbers of colors are a result of bit depth NOT colorspace. The distance between color values per bit is a factor of the size of the gamut/space. I often hear authors try to convince their readers that 16 bit has more tonal range than 8 bit, and that too is false. The range is pure white to pure black in both. Same range. Number of levels withing the range is what is different. It is extremely uncommon for me to be publicly critical of an article, but this particular piece is so out of alignment with the truth that I am finding it very difficult to remain calm and positive. Trying to keep an article simple for the reader is commendable and appreciated. Spreading incorrect information is not however appreciated. As a professional in the fine-art photographic reproduction field since prior to digital, the countless hours of re-education invested to "fix" the misunderstandings resulting from articles like this are burdensome. I personally would rather spend the time getting to understand the photographers creative vision so I can meet their needs, than spending it retraining them so they can get better results from their files. Many or most of the storybook manufacturers request sRGB, as do many printers for other options and you have to be careful choosing your printer if you opt for aRGB. Personally, I convert all RAWs to sRGB PSD files before retouching. (I use the soft proof option in LR to view as sRGB when adjusting the RAW files). If I can make it look great with this combination then there are no surprises down the way if I were to convert an aRGB to sRGB. What hasn't been discussed are people's preferences for conversion... absolute / relative etc...? Lee - you hit the nail on the head. How does the conversion process deal with out-of-gamut colors. Lightroom supports two "rendering intents" - relative and absolute - in the print module. You need to learn the difference and use the appropriate one for your prints. However, you should always use ProPhoto in your processing - and there is a very good reason. Most of the adjustments we apply are linear operations, but they can create new colors in the image. Thus, when you adjust, say, saturation, you are creating new colors in the image and even if the original image was completely sRGB (or Adobe RGB), the adjusted image may contain colors outside of those gamuts. OK - that fine. If you are processing in sRGB, then every time you make an adjustment the processor has to render the results back to the restricted space. Rendering out-of-gamut colors is a nonlinear operation and it can result in undesirable results. However, if you process in ProPhoto (which is a huge RGB space), it is very unlikely that your adjustments will create out-of-gamut (for ProPhoto) colors. So, you should always process images in ProPhoto. Then, at the very last step when you print, or when you create an sRGB JPEG as a final result, you deal with out-of-gamut colors once! Lightroom and PhotoShop print modules will show you out-of-gamut indications for both your monitor and your printer. You do your final rendering with the full light of this information, and you select the proper rendering algorithm them. Summary: Always use ProPhoto in processing to eliminate nonlinear (and uncontrolled by you) out-of-gamut renderings between each adjustment. Do out-of-gamut rendering once - in the print module. I'll have to ask the film labs that I use if they scan to AdobeRGB or sRGB. All reputable labs will scan to AdobeRGB, if they don't drop them immediately. &gt;&gt;All reputable labs will scan to AdobeRGB, if they don't drop them immediately. Far better, scan and embed the NATIVE scanner profile. Anyone could scan into sRGB and then convert to Adobe RGB and you'd never know. 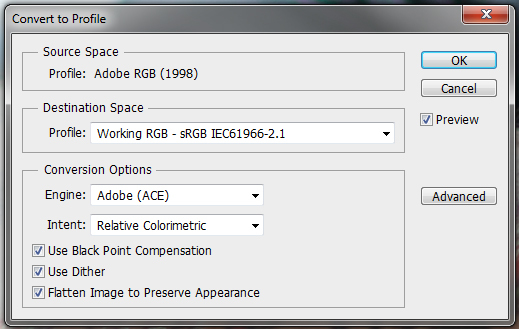 Why convert from the native scanner color space to Adobe RGB (1998)? An extra conversion for no reason, especially if (and it's quite likely) the native scanner color space has a larger gamut in some area compared to Adobe RGB (1998). I am a long time follower of this blog, and this is the first comment I have ever posted. I felt the need. This article is a wonderful, and accurate to within the confines of its content, guide for people who have yet to deal with that overwhelming world called color management (what I call color wrangling). Yes, there are more advanced discussions to be had; however, I agree that this was not the place for them. Zach, it was wonderfully informative. Beginning photographers out there, follow this advice, and you are already 1000x more prepared to face this realm of color conundrums. Any comment for those using Aperture rather than Lightroom? Paul, You can set in Aperture preferences what color space you'd like you external editor to use and whether you'd like it as a psd, tiff or jpg. I use ProPhotoRGB and a 16bit psd or tiff when I export to Photoshop CS6. 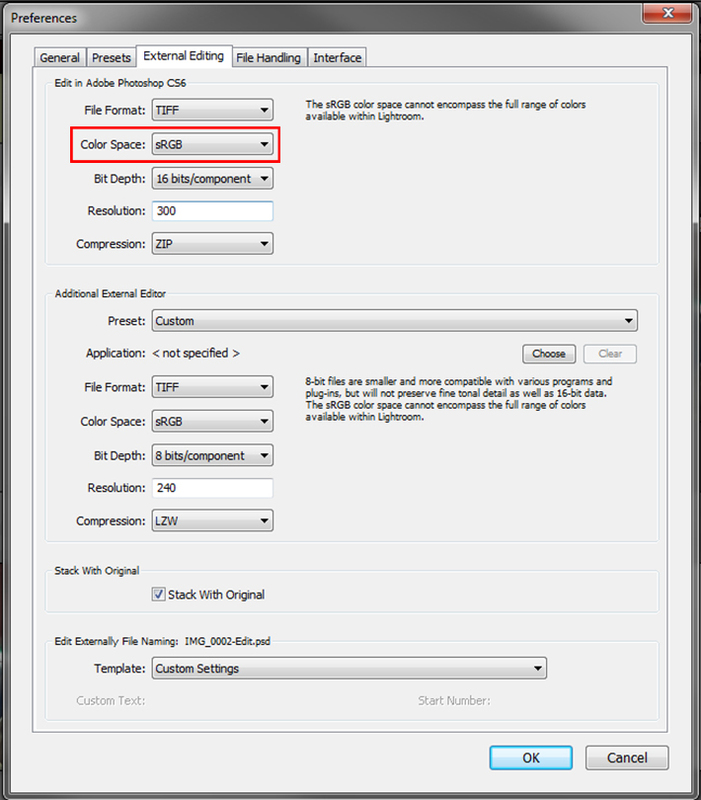 When you export a version from Aperture it exports as a sRGB tiff or jpeg. Great article. I've long been told I should shoot RAW in Adobe RGB, but was confused when nearly everything NOT done in house is produced in sRGB. Until I start printing my own work, I'll stick with sRGB. Thanks again for a very understandable article. You miss an important complication of using AdobeRGB or ProPhotoRGB when combined with 8bit per colour images (eg JPEGs). With low bit depth images, the steps between different colours (e.g. slight variations in blue in the sky, or paint on a wall) are almost noticeable with sRGB. AdobeRGB and ProPhotoRGB have larger gamuts, so the colours are further apart. This means that clean, subtle tonal variations develop distinct steps which ruin the image quality. For most real life images, there are very few pixel colours outside the sRGB gamut, so the ability to capture indigo or extreme magenta or cyan is moot. Better to keep the smooth tonal variations for the colours that actually exist in the image. I have a question when calibrating on a wide-gamut monitor. Is it better to calibrate while in sRGB or aRGB? I've been calibrating on aRGB for my ASUS PA246Q P-IPS since I do quite a bit of post-processing on Photoshop. 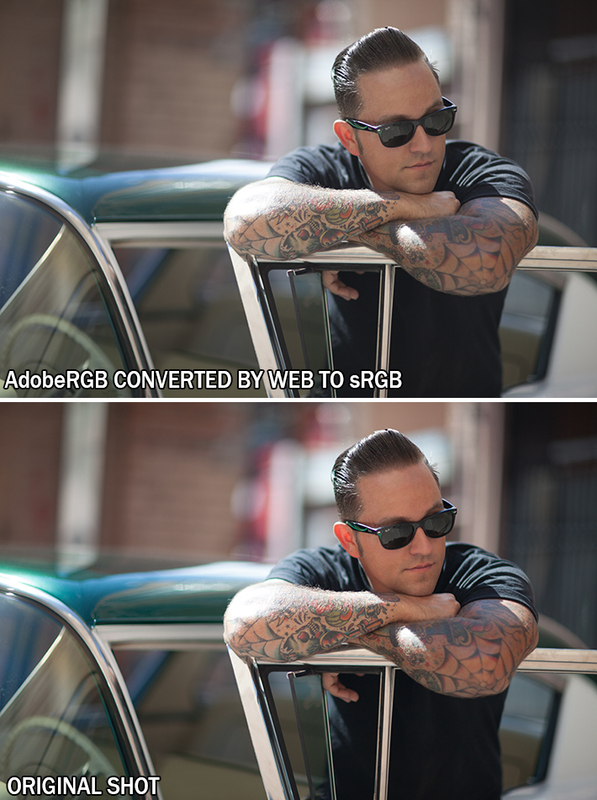 I'm not sure why the author states that you can't convert accurately from sRGB to Adobe RGB. These are colorspace models imposed on RGB data. Data is data. You can impose any colorspace you want. The colorspace model will take the RGB data and modify it relative to the colorspace specification. The RGB data is still the same. If you have an image set to sRGB, you cannot correctly convert it to AdobeRGB. It'd be equivalent to trying to put 3 liters of liquid into a 2 liter bottle. You won't get any additional colors within the color space when converting to AdobeRGB, as the color gamut has already been truncated for sRGB. Nope. The colorspace model is placed on top of the RGB data. The RGB data remains the same. You may have truncated the color, but once you're in the wider colorspace, you can retrieve it. Zack is correct in his analogy although the statement (you can not correctly convert) could be worded better. If you convert from sRGB to Adobe RGB (1998), you gain nothing at all useful, you don't make that data a larger gamut. The container as he says is bigger but the contents are not gaining more gamut but if you now create new data, or paste Adobe RGB data within this new conversion, that's fine and necessary for the initial conversion into Adobe RGB (1998). But if you think taking an image in a small color space like sRGB, then converting it to Adobe RGB provides anything useful in of itself, nope. Not a lick. Better do it in high bit too or you end up losing data in the process which is highly questionable. Not quite. If you process an sRGB image your adjustments can easily produce new colors that are out-of-gamut for sRGB. As I commented above, you should do your processing in the largest RGB space (ProPhoto) so that all your adjustment results are in-gamut. I'd call that "a lick". The last step of your processing is to "render" back to the gamut of your media (printing or sRGB JPEG) - after viewing the out-of-gamut indicators in Soft Proofing.